Live community musical groups are the life-blood of music. They provide the necessary connection that brings so much music to the masses and give an outlet to many fine musicians who have decided for some reason to remain as amateurs. They introduce many of the young to traditional musical forms. Without these groups, there is little doubt that traditional and classical musical literature would be a rapidly dying art form. The Betws-yn-Rhos Male Voice Choir is a fine example of the traditional male choir. It is a community choir that holds a large number of concerts for charitable causes, and performs many of their works in Welsh, upholding yet another tradition and keeping history alive and vital. It is evident from the recording that they are a hard-working and well-meaning group of dedicated musicians. The soloists are quite good, the arrangements are well done, and the selections are well suited to the choir. Unfortunately, this album simply cannot bring forth the energy and passion that a live performance by a community group often brings. Alas, when given repeated listening, a recording of this kind exposes the weaknesses in the group far more than highlighting strengths. The use of electronic keyboards to emulate string sections may be totally acceptable in a live performance but is sorely lacking in the context of a recording. The gusto and vigor that powers a group like this in live performance also distracts on recording, as the intonation suffers when the stronger singers try to lead the weaker by simply adding volume. Also, unfortunately, the room-acoustics of a recording studio do not allow for the natural reverb that a simple piano accompaniment needs. The piano too frequently sounds choppy and stylistically broken. This is the mark of an accompanist accustomed to performance halls where the ringing hall or background crowd noise demands an emphatic marcato style so that both the choir and listeners are able to get the beat and pitch. Additionally the room will normally color the pianist�s staccato styling giving it a breadth that is lacking in this type of recording. Additionally, it seems that the microphones were set in the studio without a lot of room for acoustic blending. All the signs are that the recording engineer opted for a large number of microphones on very few singers rather than a few room microphones. While that is the preferred method for most instrumental groups, aside from symphonic strings, it is rarely optimal for voices. This approach again highlights the shortcomings of the weaker singers rather than the strengths of the choir. This is the type of album that you really want to like, as the group deserves support. Unfortunately, it is normally a tie to an emotionally gripping performance which the listener must be present for if they are to overlook the technical shortcomings of the group. In live performance it easy to forgive intonation problems and limited funds for instrumentalists. On a recording, fairly or not, the performance standards must be higher, the equipment better. 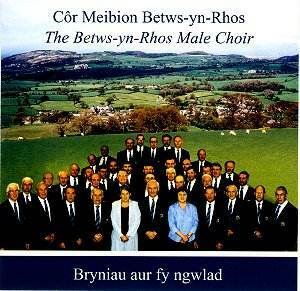 If you have a connection to this group, or have fond memories either of Wales or of another similar choir of male choristers, you should support this group with your purchase. If you are interested in seeing just how far an amateur choir can go, this will give you a solid idea. If you want to understand or support the traditions of community music groups, buying this album would be a good place to start. However, if you are looking for a truly professional recording then this album will disappoint, and no matter how much I want to like this group, I don�t feel that I can rate this recording as better than average. I really wish that I could.